I know when I promised vegetable recipes, you were not thinking “salad.” Salad is boring. Salad is easy. We’ve already thought of salad. Well, salad IS easy, but it doesn’t have to be boring. The universe of salads is huge, and if recipes for salads are more ideas than recipes, well, couldn’t we all use some more ideas? We eat salads a lot. This one takes a little more hand work than the most rushed “open a bag of lettuce, throw on some dressing” (though those feature heavily in our rotation as well), but it’s also delicate, and appealing. The Nuni loved it, the husband loved it. It’s neither all sweet nor all savory, but a lovely both/and. You can make this with a knife, but a better choice would be a mandoline. It makes quick work and beautifully thin slices. I’ve posted about mine before, but for reference, I own (and revere) the Benriner Japanese Mandoline Slicer (though I would also recommend using it with these Cut Resistant Gloves ) (Both affiliate links). ¼ cup minced fresh herbs (chives and tarragon are nice -- the chives add a savory note, and the flavor of the tarragon amplifies the fennel. I'd avoid anything woody, like rosemary, but chervil would also be good, or dill, or even celery leaves). Get a bowl of water ready, laced fairly heavily with lemon juice. Cut the apple into quarters, lengthwise, and cut out the core. Do the same with the pear. Using a mandoline, slice the apple and pear quarters into thin slices, and get them into the acidulated water. (The lemon juice helps prevent browning, and adds some flavor). Remove the stems and greens from the fennel, reserving some of the greens for garnish. Cut a slice from the root end, then cut the bulb in half lengthwise. Thinly slice the fennel halves, using a mandoline, with the root end against the blade. 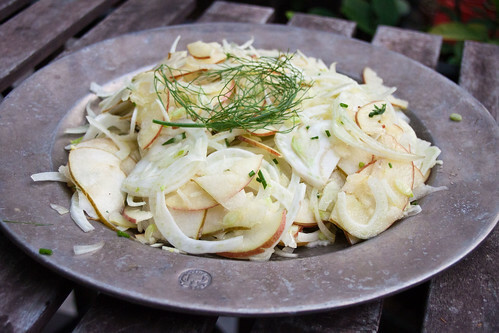 Combine the apple and pear with the fennel. Squeeze some lemon juice over the whole (about 1 small half), drizzle with olive oil, then sprinkle with the salt and herbs and "toss" until each piece is lightly coated with the olive oil. Serve immediately.